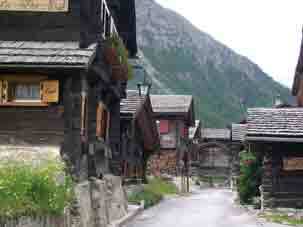 Zinal is the last village in the Val d'Annivers, which runs South from Sierre. 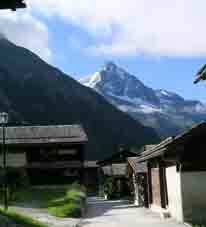 It is roughly opposite Zermatt across the Roestigraben (language frontier i.e. 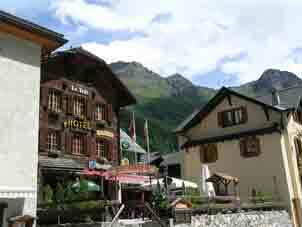 they speak French in Zinal). Take a train to Sierre (from Geneva or from other points, via Lausanne or Brig). There are buses at rare intervals from Sierre to Zinal. 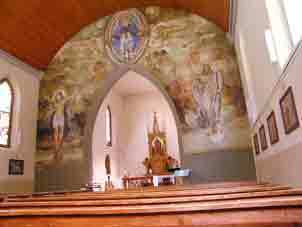 I thumbed a lift in 2007 by walking up to the road from Chippis, see this link & thumbing a lift! You can also walk in on the Chamonix-Zermatt Walk, either from Grimentz or via the Corne de Sorebois on Kev Reynolds version of the walk. ...you need somewhere to stay. Several hotels. The Post & Trift are reasonably priced. I stayed in the Trift. There are other walks up to huts available, not (yet) done by me. I have done all these walks myself. For wintry types, there is a little skiing, but I have not done any here. The town has its own web site. 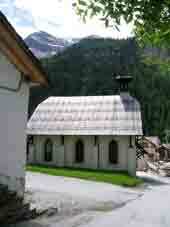 The hut is on the South side of Le Besso. There and back in a day is rather long (for this 64-year-old) but it is worth going up for the view of the 4000 metre peaks at the end of the valley. 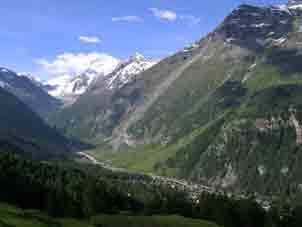 There is a long path South from the village, which climbs to a cwm at the end of the glacier valley, which hangs above the main valley. 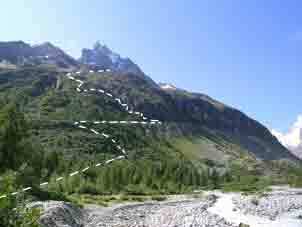 A footbridge is crossed the right-hand path taken, which winds up to a moraine top & then by zig-zags to the higher level path. This drops occasionally to accommodate gullies & has plenty of fixed rope & chains, some unnecessary. After a steep chained bit, the view below appears. This is where I stopped but it is another mile to the hut. 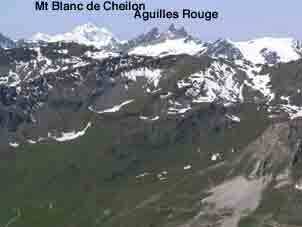 Height gain about 1300metres. 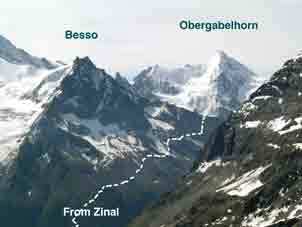 The route from the glacier cwm. This is the view one does this for. This hill is on Kev Reynolds version of the Chamonix-Zermatt walk. 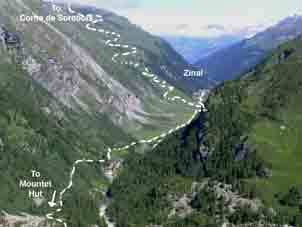 He states that the path down to Zinal is awful but there is a new path further South which is virtually, a jeep track & quite comfortable. 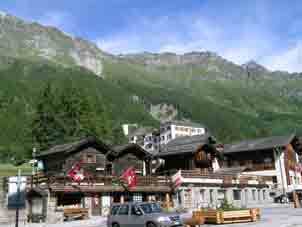 You can walk up it from Zinal or take the cable car (I did) & walk down later. 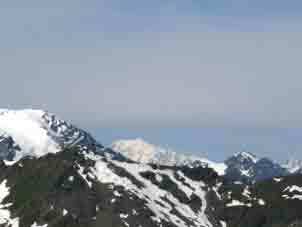 Between the pathh over from the Moiry Dam & the cable car, route finding is messed up by the ski pistes but it is easy to pick one's way to the summit for excellent views all round. I walked up with a Sergeant-Major Alpine Instructor, aged 37! (I was 64). In the far West is Mont Blanc. The view South is obstructed but SW & SE, there are fine views. To the North is the Berner Oberland. Height gain 1200 metres but not like the walk above! Contact: Ken Baldry, 17 Gerrard Road, Islington, London N1 8AY +44(0)20 7359 6294 or e-mail him URL: http://www.art-science.com/Ken/Alpine/Zinal/index.html Last revised 30/10/2010 © 2007-2010 Ken Baldry. All rights reserved.